The most frequent causes of sudden death in adults result from catastrophes in the heart, blood vessels, lungs, and brain, according to Forensic Pathology. Sudden collapse and death can occur in people with known medical risks as well as in seemingly healthy, even young people. Cardiac arrest from arrhythmias is the leading cause of sudden death in adults from natural causes, though it can also affect younger people according to the Cleveland Clinic. A review in the Journal of Electrocardiology notes about 80% of sudden cardiac deaths in the U. S. and worldwide are from cardiac arrhythmias. Top 5 Leading Causes of Death in the U.S.
An arrhythmia is a change in the normal, regular rhythm of the heart, as illustrated by the American Heart Association. Disruption of the heart's pacemakers - the sinoatrial (SA) and atrioventricular (AV) nodes - and the nerve electrical conduction system, prevents the heart from pumping blood and delivering oxygen. The heart acutely stops beating, leading to cardiac arrest and sudden death if not immediately treated. Consider the possibility of a cardiac arrhythmia in anyone with these symptoms. Treatment may prevent sudden death. Note any symptoms especially in the young and athletes as this demographic tends to ignore signs. Heart disease is the number one cause of death in the U. S., according to the Centers for Disease Control and Prevention. 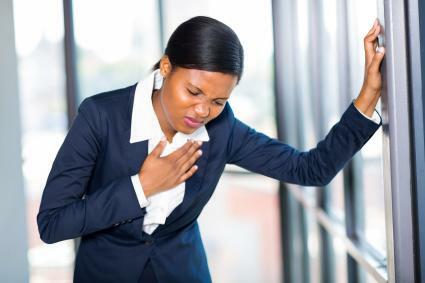 An acute heart attack from coronary heart disease (CHD) is a leading cause of sudden death. 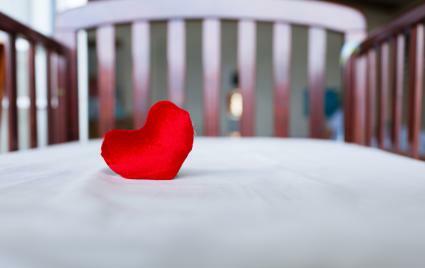 Based on a review in the journal Circulation, 50% of all deaths from CHD are sudden deaths. The National Heart, Lung, and Blood Institute (NHLBI) notes a major blockage of an artery or arteries from coronary artery disease decreases blood flow and oxygen supply to heart tissue. Insufficient blood and oxygen cause tissue damage and a heart attack, or acute myocardial infarction (AMI), which can lead to sudden cardiac arrest and death if not immediately treated. 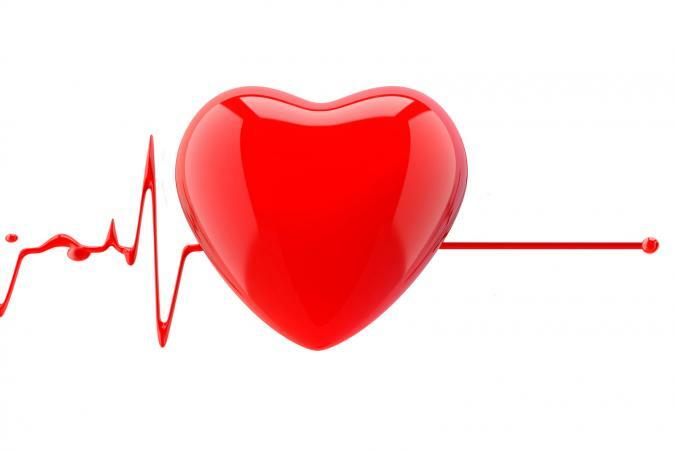 The damage to heart tissue from lack of oxygen supply can also disrupt the electrical system of the heart and cause unstable rhythms which could also be the cause of the cardiac arrest. Change in lifestyle habits and regimented treatment of risk factors and symptoms may prevent an acute heart attack. Many people ignore recurrent episodes of these symptoms and the next thing you know they faint, collapse, and die. Death from a pulmonary embolus (PE) can be sudden and devastating. According to MedlinePlus, a PE occurs when a piece, or pieces, of a blood clot from a leg vein (or pelvic vein) breaks off and travels through the main vein (vena cava) to the right side of the heart. From there the embolus goes to the lungs and blocks one or more arteries there and cut off the blood supply to the affected area of the lung. A significant loss of lung tissue decreases oxygen supply to the brain and the rest of the body. When this happens, a person will collapse and can die. Decreased blood flow from the lungs to the left side of the heart also interferes with the function of the heart and diminishes the blood flow from the left ventricle to the rest of the body, contributing to sudden death. Prompt treatment can prevent death from a PE. 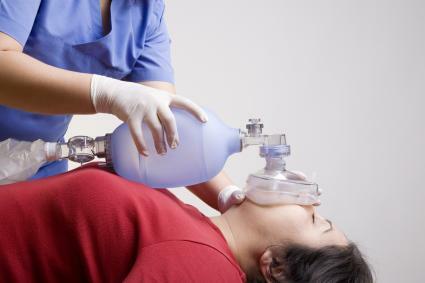 Acute respiratory arrest can cause sudden death if breathing can't be restored. When breathing stops for more than five minutes, it causes damage to vital brain function and leads to death. The interference with oxygen supply can also lead to cardiac arrest which contributes to brain damage and death. In many cases, a person might be saved if the underlying cause of the acute respiratory arrest is promptly treated. According to the American Stroke Association (ASA), a hemorrhagic stroke is a rupture of a blood vessel in or over the brain. The hemorrhage can cause damage to vital brain tissue and a sudden, catastrophic death. Sudden death occurs from the disruption of the normal blood flow and oxygenation to the affected area of the brain. Increased pressure caused by the hemorrhage on the brain, can also lead to death. Other factors that can contribute to death include accompanying cardiac arrhythmias and depression of the brain's breathing center. 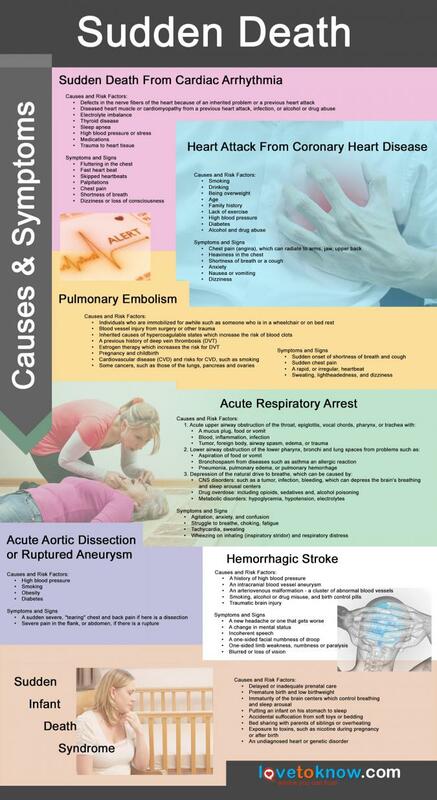 Loss of consciousness and sudden death then ensues if treatment is unavailable or not helpful. An acute dissection or rupture of the aorta (the major artery of the heart) is a common cause of sudden, catastrophic death. According to a review by the Journal of Emergency Medical Services, an "aortic catastrophe" (a dissection or a rupture) is one of the five most common causes of sudden death. An aortic dissection or rupture occurs because of a weakening of the muscle wall of the aorta, anywhere along its route from chest to abdomen. In an aortic dissection, blood dissects in between the inner and middle layers of the three layers of the muscle wall of the aorta. In a rupture, blood bursts through the bulging aneurysm of all three muscle layers. A dissection or a rupture can lead to significant internal blood loss, cardiac arrest, and sudden death. An abdominal aortic aneurysm might be seen on an imaging study or be large enough to be felt through the abdomen by a doctor and repaired by surgery before it ruptures. The death of a healthy infant during sleep from Sudden Infant Death Syndrome (SIDS) is devastating. The sudden, unexpected, unexplained crib death occurs in infants less than a year old, according to the National Institute of Child Health and Human Development (NICHD). A total of 3,500 infant deaths were "sudden and unexpected infant deaths" or SUIDS - most from explainable causes, such as infections. Of the 3,500 cases, 1,500, or 43%, were SIDS, or unexplainable infant deaths. Non-Hispanic African American infants were twice more likely than non-Hispanic Caucasian infants to die of SIDS. Hispanic and Asian/Pacific Islander infants had the lowest rates of SIDS. No other warning signs before a SIDS death have been described. The United States' NICHD Safe to Sleep campaign has decreased the incidence of SIDS by 50% since 1994 by encouraging parents to put an infant to sleep on his back instead of his stomach. The #1 most common cause of death for teens is accidents. These unintentional injuries most often occur because of automobile accidents and could actually be preventable. According to the Centers for Disease Control and Prevention, six teens are killed every day from injuries due to a car accident. The #1 most common cause of death for men and women under the age of 35 is accidents/unintentional injuries which are (again) mostly attributed to automobile accidents. The most common cause of death for both middle-aged men and women is heart disease with cancer closing the gap and coming in at a close second. The most common cause of death for seniors is heart disease which includes heart attack, heart failure, and heart arrhythmia. This is typically associated with other ongoing health issues such as diabetes, high blood pressure, and smoking history. If vomiting occurred prior to sudden death, it may have been a warning sign for imminent cardiac arrest. If sudden death occurred during sleep, there are multiple causes as to why it could have happened. Cardiac arrest, respiratory arrest, certain genetic conditions and sleep disorders such as obstructive sleep apnea. If sudden death happened during exercise, this would typically be due to an undetected heart defect or advanced heart disease that the person was not aware of. If there was a sudden death during pregnancy, there could be numerous reasons as to why it may have happened. A few of the possible causes include blood clots, hypertensive disorders, eclampsia, postpartum hemorrhage, and infection. This interesting infographic sums up symptoms, signs and risk factors you should be watching for to live a long and healthy life. The common causes of sudden death occur in the major vital organ systems of the body. If you or those you care about have risk factors, attention to prevention or treatment of these factors may prevent their sudden death. Also, putting your infant to sleep on her back can decrease the chance of losing your child to SIDS. Always remember to call 911 if you see someone collapse, or you can't wake up your baby.